Two of Little Bay Park’s boundaries are important thoroughfares in the borough of Queens: Cross Island Parkway and Utopia Parkway. The third boundary is beachfront. Parks acquired the property via condemnation in September 1950. The agency planned to develop the shoreline area but the construction of the Throgs Neck Bridge and the fiscal crisis of the 1970s put an end to the plan. Previously known as Clearview Park, Parks assigned the property’s present name in 1973. The Mantinecock tribe originally inhabited the shores of Little Bay. But in 1644, King Charles I of England gave 16,000 acres of land to his countryman William Lawrence. The grant, which included today’s Bayside, stimulated European settlement in the area. In 1683, when the Crown organized the New York colony into ten separate counties, the land became part of Queens County, which encompassed both present-day Queens and Nassau Counties. There is little available information about Bayside for the hundred years between 1683 and 1780. A fire in the town clerk’s home in the 1780’s destroyed much of Bayside’s pre-Revolutionary documents. New York State Attorney General Aaron Burr (1756-1836) linked the fire to arsonists, whom he put on trial. During the Revolutionary War (1776-1783), the area was predominantly Tory and was occupied by British Troops. The political sympathies of the area prompted two unsuccessful attacks by Patriot raiders who traveled by whaleboat from New Rochelle. In 1866, the North Shore Railroad was extended through Bayside. Soon after, the dozen families who owned land in Bayside sold their holdings to real estate developers. During the succeeding three decades, prominent New Yorkers constructed extravagant mansions in the region. By the turn of the century, Bayside had also become an enclave for actors who worked for the burgeoning film industry located in Manhattan and Long Island City. Moviemaking migrated to California in the 1920’s, and the community supported itself on the lucrative Little Neck shellfish beds. Today Bayside is a prosperous residential community linked to the rest of New York City by the Long Island Railroad and the Throgs Neck Bridge. In 1955, the Triborough Bridge and Tunnel Authority decided to build the bridge, which connects Bayside with the Bronx, in order to accommodate the excess traffic on the Bronx-Whitestone and Tribororough Bridges. Othmar H. Ammann, who designed the George Washington (1931) and Bronx-Whitestone (1939) Bridges, drew up the plans. The Federal Aid Highway Act of June 1956 provided aid and construction began in October 1957. Completed in 1961 at a cost of $92,000,000, the Throgs Neck Bridge has a maximum capacity of 30,000,000 million vehicles per year. The main suspended span extends 1,800 feet, which is connected to land by a 6,400-foot viaduct at the bridge’s northern approach and by another 4,100-foot at the southern end. The Clearview Expressway, which was completed in 1963, connects traffic to the bridge. The southern viaduct of the Throg’s Neck Bridge intersects Little Bay Park, limiting its use as a beach, but the park still offers splendid views of Little Bay, the East River, and the bridge itself. In July 1998, the park received a $666,000 renovation sponsored by Council Member Michael J. Abel that included the refurbishment of the athletic fields. 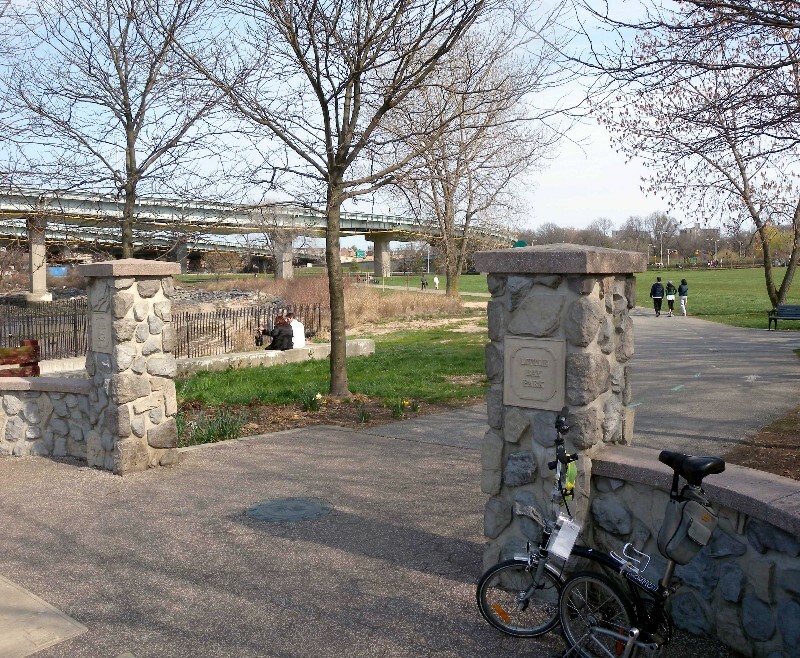 In August 1999, Council Member Abel sponsored a further $1.2 million renovation that provided a roller hockey rink and a shoreline bicycle path (designated as part of the New York City Greenway). The park boasts two football/soccer fields, a baseball field, and sitting areas along the shore.